…that you may not have thought of! Are you still considering whether to come to the Legacy Grandparenting Summit or not? I’m sure you have weighed “Can I afford it?” against “What will I benefit from it?” Many of you have already registered; in fact, with two months to go, we have over 500 who have already decided to attend. That number will grow quickly as the time gets nearer. We are expecting hundreds more, and are praying for 3,000. We know you are going to gain some incredible insights from our very wise and gifted speakers. We know you are going to love the worship, and laugh with our Christian comedians. We know you are going to be incredibly energized and excited by the whole thing. You change the thinking about grandparenting. Look, the status quo—that grandparenting is being overlooked and under-resourced—is simply not acceptable. The larger the conference is, the more Christian media will notice, and will consider Christian grandparents a worthy audience. Pastors will start talking among themselves, and will change their definition of ‘family ministry’ to include grandparents. You encourage writers, speakers, and publishers to develop materials on Christian grandparenting. When they see a bigger audience, they will be quicker to create resources and get those into peoples’ hands. New voices will emerge. Churches will have curriculum for seminars, studies, and small groups on grandparenting. You will financially support the Legacy Coalition. As a brand new organization, we are dependent upon God’s people to see our vision, align with us, and partner with us. Our ability to grow depends on financial resources, as well as people resources (like every ministry). We have set our budget to break even at about 800-900 people. Every registration above that number is a donation of sorts that will help empower us to expand our ministry another year. You help create positive momentum in the midst of a negative world. No matter how the election goes in early November, we’re going to need a re-focus–a way to re-engage our generation for something positive, something spiritual, something effective. Making grandparents aware of their incredible potential to change our world through intentional grandparenting will do those things. When you come to the conference, your mere presence contributes to this. You help to launch a national movement. We know you care about your grandchildren. We know you also care about grandparents being intentional and influencing their grandchildren spiritually. But there are so many grandparents that haven’t thought about this, and we want to get their attention! A national conference is our attempt to start a national movement; every person that comes becomes a voice for this, and the more voices we have, the more we will see the movement take root. Last year at this time, there were just a few dozen people thinking about a ministry to grandparents; now there are a few hundred. Next year at this time, we want it to be a few thousand. Who knows what 2020 will hold. But let’s get going! 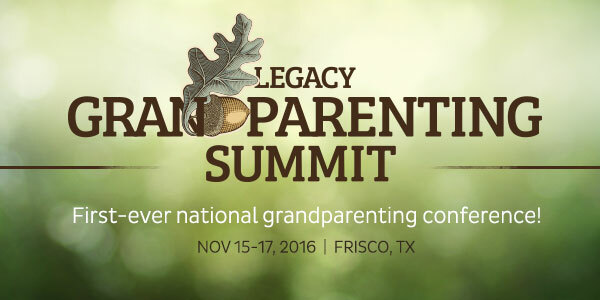 Help us by joining us—and encouraging others to do the same—at the Legacy Grandparenting Summit in Frisco, Texas, November 15-17, 2016. See you there!! !